San Jose, CA (Aug. 28, 2013) – A first-time fashion extravaganza celebrating a new season of style, a new store to explore and the annual holiday celebrations are part of anticipating cooler day at Santana Row. A Saturday of fashionable fun, focused on Fall Fashion 2013! Santana Style Stroll from 1 p.m. to 4 p.m. Begin the day exploring The Row for specials meant to make you feel and look your stylish best. Meet Silicon Valley style experts who will be stationed in select stores to show you the latest trends. Guests will receive a swag bag of goodies and be pampered with beauty treatments, touch-ups and mini massages. Stylists, fashion editors, bloggers and professional consultants will help you navigate the trends that will best work for your lifestyle and offer advice and inspiration. To push everyone toward taking a style leap, professional models will be wearing fall’s freshest looks inside the designated shops, including Flying Lizard, Jest Jewels, Ted Baker, Blues Jean Bar, AVEDA, Donald Pliner, Cole Haan, Kate Spade, Tommy Bahama, Chico’s and Boutique Harajuku. Along the way guests are invited to sip cocktails and taste savory (and sweet!) treats. Tickets are $30 and benefit the Junior League of San Jose. Stop by the concierge office or go towww.SantanaRow.com to purchase tickets. Prix-Fix Fashionably Late Lunch from 2 p.m. to 6 p.m.
Famished from your fashion marathon? Check out the menu at several Santana Row restaurants offering a $20 two-course special with a drink or dessert option. The Row Fashion Shows on the Outdoor Runway, 6 p.m. to 10 p.m.
Start or end your evening celebrating style on The Row with free outdoor fashion shows every 30 minutes. Models will walk down the main street of Santana Row on a raised catwalk that runs from Madewell to LB Steak. Fall favorites from a designated store will be featured every half hour. In between, fashion revelers can pop into the in-store parties going on near the runway at retailers and be part of special style presentations and parties in various stores, all free and open to the public. Participating stores include Anne Fontaine, Gucci, Calypso, Madewell, Splendid, Free People, Furla and Franco Uomo. The in-store parties will include DJ’s, window modeling, cocktails, trunk shows, discounts and more. A special media area will be set up at the end of the runway with seating for reporters and bloggers and a riser for photographers. Please contact Donna Kato for more information. 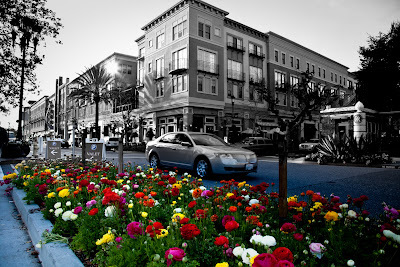 Enjoy a weekday afternoon at Santana Row with lunch plus a show. A two-course lunch is offered at participating restaurants followed by a matinee at CineArts Theatre. Present your same-day itemized receipt to the Santana Row Concierge Center for a movie voucher that can be redeemed for any weekday matinee. For a full list of participating restaurants and specials, go to SantanaRow.com. Learn all about safety with local heroes from the San Jose Fire Department and Police Department. After the safety lessons, families can enjoy a live musical performance from Andy Z with the local public safety heroes joining in the fun! Face painting, balloon animals, arts & crafts and educational activities are designed for parents and their pre-school aged children. Details: 10 a.m. to noon at Park Valencia. Mommy & Me & Daddies, Too is a free kids club held on the second Tuesday of every month from May through December. For more information, call 408.551.4611 or visitwww.SantanaRow.com. Amsterdam-based fashion brand Scotch & Soda is opening its first South Bay location at Santana Row just in time for the holiday shopping season. Scotch & Soda at Santana Row will offer high-quality clothes and accessories for men and women. Rich in detail, they’re typically inspired by the best tried-and-tested classic and vintage styles and enriched with a wealth of inspiration from around the world. Though Scotch & Soda has been around since the ‘80s, the international fashion brand as we know it today originated in 2001 when the new owners combined their broad experience and shared love for making great garments. The women’s collection, Maison Scotch, entered the market with the Spring/Summer 2010 collection and accounts for a large part of the company’s continuous growth. For more information about the store, go to:www.scotch-soda.com. No tricks, just treats! Wear your costume and trick-or-treat on The Row. Enjoy pumpkin decorating, Halloween photos, craft projects and a live musical performance by Andy Z. Santana Row will provide a FREE trick-or-treat bag for kids. The holidays remind us to pull together and help those less fortunate and November’s program encourages kids to bring a canned food item that will be donated to Second Harvest Food Bank. Holiday fun includes face painting, balloon animals, Arts & Crafts with Action Day and mini manicures for little ones by Lavande nail spa. Moms and kids will be entertained by music and performances by Ballet San Jose School, the Harvest Scarecrow and Andy Z. Snacks are provided by Happy Family Brands and there’s a drawing to win a $50 gift card from The Container Store. When: 10 a.m. to noon at Park Valencia. Mommy & Me & Daddies, Too is a free kids’ club held on the second Tuesday of every month from May through December. For more information, call 408.551.4611 or visit www.SantanaRow.com. Santana Row celebrates the 2013 holiday season with the annual Light Up the Row Tree Lighting Ceremony, a day of fun for the entire family. The day of holiday festivities include live music, costumed characters, special guests, performances by local theater and dance groups and the lighting of the 40-foot Christmas tree, making this one of the most exciting holiday events in Silicon Valley. Festivities are scheduled from 3 p.m. to 9 p.m., with tree lighting slated for 7 p.m. in Santana Row Park. The full lineup and guest stars will be announced soon. Santana Row celebrates the first night of the Jewish Festival of Lights with Kosher treats, entertainment and activities that include decorating dreidels, Jewish story time, arts & crafts and the lighting of the Menorah. The evening is co-hosted with the Jewish Federation of Silicon Valley and The PJ Library. The celebration will take place from 4:30 to 6 p.m. at Park Valencia. The last Mommy & Me & Daddies, Too for the season includes live entertainment from Andy Z, story time with Mrs. Claus, sampling from Happy Baby Brands, mini manicures from Lavande nail salon, a raffle from The Container Store, arts and crafts with Action Day Primary Plus, Balloon Animals and Face Painting and more! When: 10 a.m. to noon, weather permitting, at Park Valencia. Mommy & Me & Daddies, Too is a free kids’ club held on the second Tuesday of every month from May through December. For more information, call 408.551.4611 or visitwww.SantanaRow.com. Ground breaking for Centerra: Thurs. September 12, 2013 at 12PM.